It all started over 30 years ago when I was in middle school. I had my first introduction to woodworking in shop class. Since the first day of class I was eager to get building something. The teacher, seeing how eager I was about this class, picked my design, a simple two shelf pine bookcase, which still exists today. Soon after that I bought a couple of woodworking books and my first two power tools, a 1 ¼ hp router and a jigsaw. I used to sit in the basement of my parents house, in my makeshift workshop, sawing and routering any piece of wood that I could find. I remember thinking that it would be great to make wooden signs with my router and sell them. Later in high school I took another shop class, where I learned how to make dovetail joints. 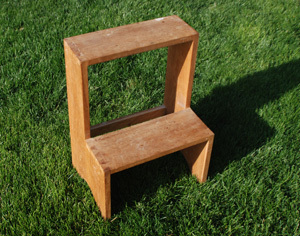 Our assignment was to build a step-stool out of hardwood, using dovetails. Over the next 12 years I went to college, earned a Bachelor of Science degree, got a job in the corporate world and continued to do woodworking as a hobby. As the years passed I added to my tool arsenal and learned new techniques. In June 2006 our daughter Nicole, had a relapse of her cancer that she had been fighting for the past three years. At the time I had left the corporate world and was in between jobs. Not knowing what I wanted to do and knowing how much I enjoyed woodworking, my wife suggested that I start my own custom woodworking business. This would allow me to do something that I loved, but would also allow me to help take care of Nicole. Later that year on December 7, 2006, Nicole went home to be with the Lord at the age of 12. After months of planning and after 30 years of woodworking, Kaleo Custom Woodworking began operations. Since the company has started I have been really blessed with continuous work, but also with the talent to do something that I love to do. As I read once before, if you wake up in the morning dreading to go to work, it might be time to find a new job. "People who enjoy what they are doing, invariably do it well."